This year, our May Revelers will partner with the Birdhouse Center for the Arts to properly usher in the May in Lambertville, NJ. Join us on Saturday, May 4 at 1 pm. Learn songs and dances associated with a traditional May Day celebration! The event is free and open to the public. The Revelers, dressed in English country costume, will sing a variety of seasonal English and Celtic songs. The dances have their roots mostly in Morris and English Country dance traditions, though one annual favorite, La Bastringue, hails from French Canada. 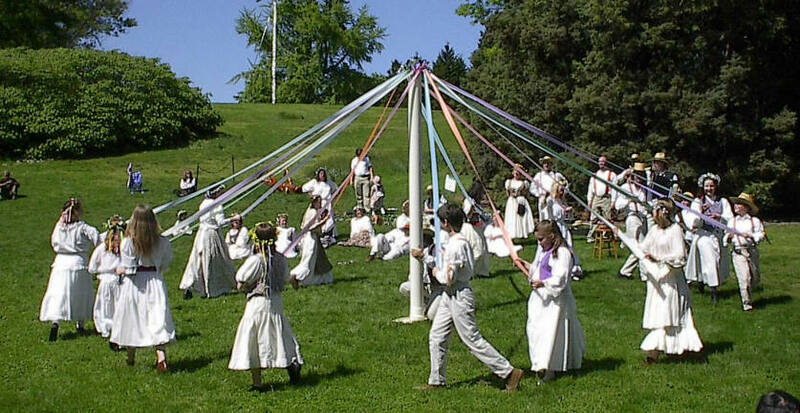 And, of course, the group will perform the quintessential Maypole dance. Interested audience members will be given a chance to learn the dances and participate. The Birdhouse Center is located at 7 North Main St. in Lambertville. From the Delaware River, follow Bridge St. about a quarter mile inland to Main. Turn left on Main. The first drive on the left will lead you back to the Birdhouse. Since we will be performing in their parking lot, please park out on the street.